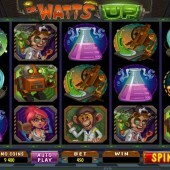 Dr Watts Up is a 2013 slot release from slot developer Microgaming who are seemingly launching slot after slot at a rate of knots. This is good in terms of content production but it also means the quality of the slots they are releasing might not be as high as they could be. This 5 reel, 243 ways to win slot is not one of the worst slot games out there but it certainly feels like it could have been so much more. The game has a theme based on the hero Dr Watts Up. The imagery is a little crazy and leftfield but it’s all good. Symbols in this slot include Dr Watts Up’s female assistant, a seemingly loopy lab rat, test tubes, an experimental brain and other scientific lab odds and pieces. A deeper look into this slot soon has you realizing it has a bit of a template feel to it. There is a free spins bonus round and a pick ‘em bonus but that’s where the bonus features fun ends. There obviously the Wild symbols and Scatters that can help you win prizes but there’s no randomly triggered feature or extensive bonus features. The Wild symbol is represented by the Dr Watts Up Logo and is a symbol you will want to keep a look out for. It substitutes for all other symbols except for the Scatters to complete winning combinations. There are two Scatter symbols that help to trigger the two bonus features. The first Scatter symbol is the Nexus icon. If you hit three or more of these across the reels then you will trigger the free spins bonus round where you can be awarded up to 20 free spins. Unfortunately, these free spins cannot be re-triggered which is another flaw in this slot. The second Scatter symbol is the loopy lab rat icon. If you hit three or more of these across the reels then you will be taken to a second screen where you must pick from a selection of test tubes to reveal bonus prizes. 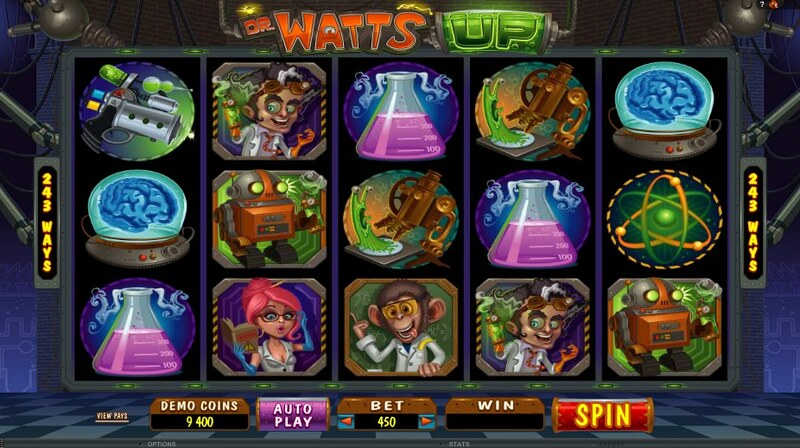 Dr Watts Up is far from being Microgaming’s worst slot release. It is definitely better than the visually-poor Alaskan Fishing and the lacklustre Mad Mad Monkey slot. However, this is a game that I will criticize more for not living up to its potential. So much more could have been done with this slot but Microgaming is more concerned with adding another slot to its portfolio than actually releasing a slot that could have been so much better.